Right then, a quick run through of what I've been watching. Nothing really stood out as being particularly great this week - though I quite enjoyed The Lost Weekend, a Billy Wilder picture from the 1940s which concerns a struggling writer's battle with alcoholism. Ray Milland was appropriately tortured as the alcoholic author, and there are some interesting visual flourishes (especially the scene in which Milland starts to hallucinate). Backbeat is a film which I have mixed feelings about. It's set in Hamburg in the early '60s, telling the story of The Beatles' original bass player, Stuart Sutcliffe and his departure from the band to be with his German fiancee, Astrid Kirchherr. I found the film to be rather flawed, but not without some strong redeeming features. On the one hand, the performances of Stephen Dorff (as Sutcliffe) and Sheryl Lee (as Kirchherr) were pretty bland, with the viewer given little reason to care about these two dull but attractive individuals. On the other hand, I loved Ian Hart as John Lennon - he's excellent as an acid tongued, charismatic and angry young man clearly destined for stardom. 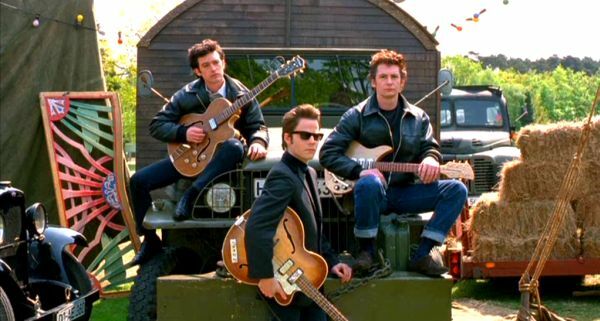 The film also really comes to life during any scene in which the group is playing. An all star line up of '90s musicians (including Dave Grohl, Mike Mills and Thurston Moore) were responsible for recording the music used in the movie, and they give some electrifying performances of classic Beatles rock and roll covers such as Road Runner, Twist and Shout and Long Tall Sally. Definitely worth a look for Beatles fans. There was one real contender for turkey of the week - the hugely disappointing Take This Waltz. I'm usually a big fan of Michelle Williams and Seth Rogen, so I felt more than a little let down with this smug, tedious attempt at a romantic drama. Williams plays Margot, a woman in a stable but dull relationship with cookbook author Lou (Rogen), who finds herself tempted into entering into an affair with Daniel, a neighbourhood artist. I suppose my biggest peeve with this film was that neither Margot nor Daniel were at all likeable - Margot is neurotic to the point where she finds herself unable to walk in an airport for fearing of 'missing a connection', while Daniel is overbearing, pretentious and seemingly without scruples in the way he greets Lou like an old friend while simultaneously romancing his wife behind his back. The movie also seemed to be trying far too hard to be quirky - meaning various elements of the film felt entirely false and artificial. Particularly irritating examples of this are the baby talk which Margot and Lou habitually engage in, the fact that Ben is working on a wacky cookbook consisting of entirely chicken related recipes and that Margot's principal hobby seems to be gatecrashing a water aerobics class for the over 70s. While I have to admit I enjoyed the scene in which Margot finally realises that she's fallen for Daniel (whilst on a waltzer, to the strains of Video Killed the Radio Star), other than that, this movie was a dead loss. "Jake Gittes: How much are you worth? Noah Cross: The future, Mr. Gittes! The future."